You are here: Home / Featured / Opinion / Barrtalk / Cockhill Bridge: What’s in a name? Cockhill Bridge: What’s in a name? Let’s hope the naming process doesn’t drag on for the next thirty years too! A bunch of sods? 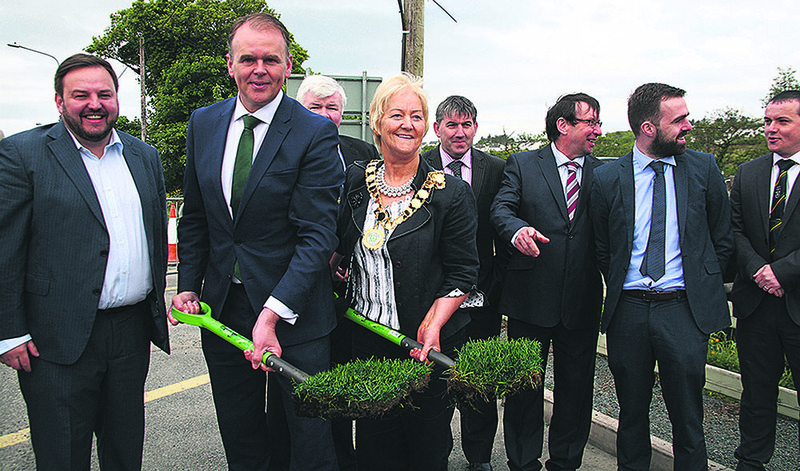 Minister of State Joe McHugh with Inishowen Mayor Rena Donaghey, Senator Padraig MacLochlainn, Cllr Nicholas Crossan, Cllr Paul Canning, Cllr Albert Doherty, Cllr Jack Murray and Cllr Martin McDermott at the Cockhill Bridge sod-turning ceremony. With construction work finally set to begin next month, I hear the Shinners [Jack Murray at any rate] are calling for a public consultation process on the naming of the new Cockhill Bridge. A good idea. But one that should be treated with extreme caution, particularly when you consider what happened across the water earlier this month. The British held an online vote to name a new polar research ship with ‘Boaty McBoatface’ coming out as the most popular choice by far [although thankfully sense prevailed and they eventually plumped for the RRS Sir David Attenborough – in honour of the legendary naturalist]. Hopefully the same won’t happen here. Can you imagine the official opening ceremony at the new Bridgey McBridgeface in Cockhill circa 2018? Of course, after the visit last week, the Buncrana ones may well opt for the Prince Charles Bridge. After all, the last time a British royal visited these parts, the town ended up with a Victoria Bridge. Those also in the frame would be hometown playwright Frank McGuinness; Tip O’Neill, whose grandmother was from Buncrana; and Cllr Eddie Fullerton, who had been one of the town’s most popular and hard-working county councillors before his 1991 murder. There’s also the fact that the first sod just happened to be turned last Wednesday May 25, exactly 25 years to the day since Cllr Fullerton was killed: surely a cosmic sign if ever there was one. Maybe Joe McHugh deserves a shout too, since he was the one who eventually secured the money when all was said and done after all these decades – although the Minister McHugh Bridge might be stretching it somewhat. And then there’s the local Cockhill Bridge Action Group protest lobby, whose vocal campaigning of late almost certainly spared us further years of traffic torment and near misses on the narrow structure – although [like with McHugh] the CBAG Bridge doesn’t seem like the most inspiring of choices. My money would be on the Eddie Fullerton Bridge – I can’t think of a more deserving recipient of the honour – but in the end the council will probably allow for some public discussion and then opt for a neutral, nondescript title like Derry’s beautiful-looking but terribly-named Peace and Foyle bridges. Then there’s always the most straightforward option: The Cockhill Bridge; although that could cause quite a degree of confusion, particularly with the old bridge set to remain standing as a pedestrian footbridge. That’s it settled then. The New Bridge it is. To read the rest of Barrtalk click here.